The 1939 film The Wizard of Oz is one of the most iconic films of all time. It launched Garland into the throes of major movie stardom. Though the film made Garland’s career, it also ruined her life. The Wizard of Oz was a gorgeous, Technicolor film, but there was undeniable darkness on set. From crippling addiction and devastating assault to injury and ever near-death experiences, behind the scenes of Oz will change your perspective on the classic film. It’s hard to imagine The Wizard of Oz without iconic actress Judy Garland, but she almost didn’t play Dorothy. “Over the Rainbow” is one of the most well-known songs of all time, but it almost didn’t exist as we know it. The Wizard of Oz had an insanely long run-time. It was two hours long, and producers had to cut it down by at least 20 minutes for it to be a reasonable length. 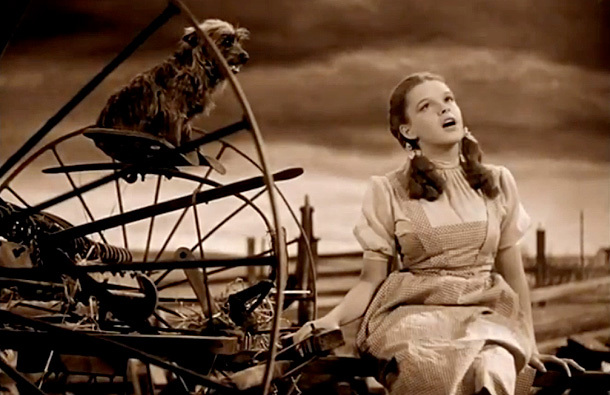 “Over the Rainbow” was originally cut because producers thought the black and white scenes dragged, and that younger audience wouldn’t understand the song’s message (they were totally wrong). Instead of cutting the version Dorothy sang in Kansas, they ended up cutting the reprise when Dorothy was imprisoned in the Wicked Witch’s lair.